Cancer is a frightening word, even for adults. How much more so for children! And yet it is something that touches all of our lives to one degree or another. When I was 7, a little boy in my class lost his arm to bone cancer. I still remember seeing him diving off the high dive at the pool the following summer. Sadly, he died when we were in 5th grade. That same year, my parents borrowed a guitar for me to learn on. The guitar had belonged to another girl who had died of leukemia, and I was afraid that using that guitar would somehow contaminate me. I was convinced I was going to die. I didn’t, of course. Honest. I’m not writing this from the great beyond. But there are so many misconceptions about cancer. When it touches our lives, it makes sense to teach kids about it. St Jude Children’s Research Hospital has put out a lovely book written by kids who are patients and who have each chosen a letter to symbolize a different aspect of the disease. 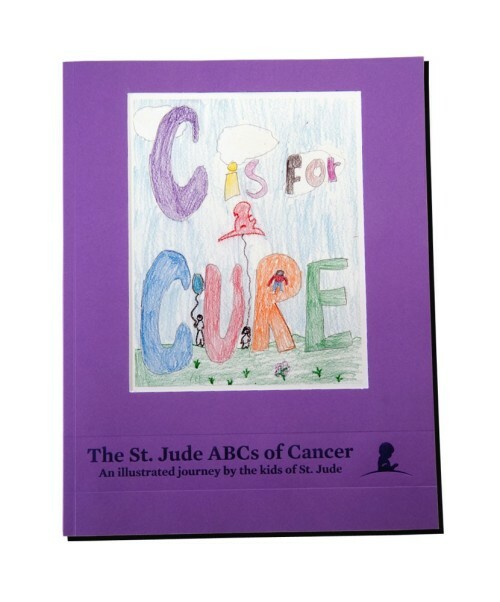 Titled The ABCs of Cancer, it consists of the reproductions from the Alphabet Wall at the hospital, along with a brief bio of each young author or artist. The topics range from the immensely practical–the names of drugs, for instance–to things like Hope, Life and God. “T is for Topotecan, the chemo that made the tumors in my skull disappear,” writes 10 year old Christian, along with a drawing of an IV pole. “W is for Wishing. Sometimes I wish upon a star that kids get better near and far,” says Katlin, age 7. F is for fever and X is for x-ray. Books like this one can help kids learn more about cancer and take away some of the fear of the unknown. And it’s also a fund-raiser for the hospital and is sold through the gift store. Another book that helps support St Jude is Loukoumi’s Celebrity Cookbook. This book doesn’t specifically deal with childhood cancer, but a percentage of the sale proceeds go to St Jude, and it’s a fun book for budding chefs. One thing I especially like was the varying levels of difficulty. For younger kids or those just starting in the kitchen, there’s actress Miranda Cosgrove’s spaghetti tacos (for those of you with very strong stomachs! ), which mostly consists of putting spaghetti into pre-formed taco shells and eating. For those further along, there are recipes that would definitely need adult help–Greek lasagne (meteorologist Nick Gregory) or Fresh Pasta with Bolognese Ragu (Actor Neil Patrick Harris). 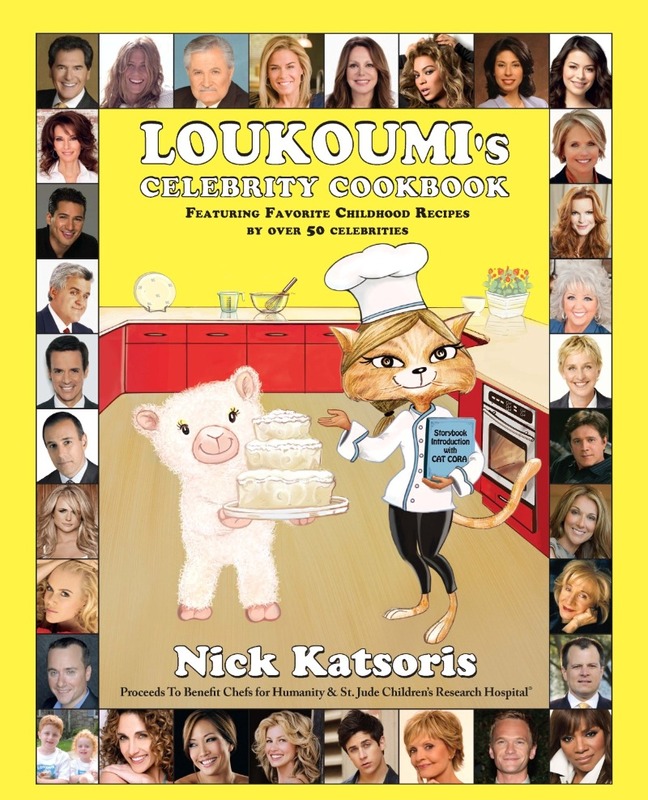 opens with a short story, in which Loukoumi the lamb introduces his friends to celebrity chef Cat Cora (who’s an actual cat in the story, but a normal human in real life). Cat teaches Loukoumi and his friends how to make her favorite recipe–her grandmother’s Italian Cream Cake. They learn how to measure ingredients carefully, to always have an adult turn on the oven, and that you can’t make anything delicious without making a little bit of a mess. And the first recipe in the book is for this cake, which looks fantastic but is definitely on the more complicated end of things. The two books together would be a lovely combination for a child dealing with someone close who’s been diagnosed with cancer. The ABCs of Cancer could help her/him learn about the disease, and then she or he could bake something delicious for the loved one. That’s just an idea, and I’m sure you can come up with others. But both books support kids struggling to defeat cancer, and that can help make for some excellent reading. I was proud to be part of a blogger awareness trip to St. Jude’s. My expenses were covered, but my words are my own.